For our latest expedition we went out for a night of live stand up comedy. Combining local clubs, touring acts, cable networks, netflix, and the White House correspondents dinner, the American art form of stand up is far reaching and growing. 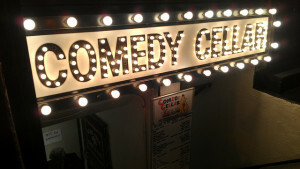 We headed to the The Comedy Cellar in New York City with our special guest, Leonidas Martin from EnMedio. 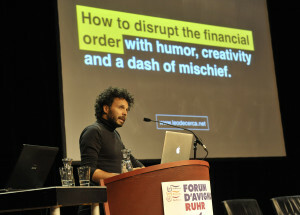 Leonidas Martin As an artist, professor, activist and “expert joke teller,” Leonidas Martin has invigorated the wave of Spanish protests beginning in 2011 known as M15. When not teaching new media and political art at the University of Barcelona, writing about art and cultural politics for online and print media or directing and producing documentaries, Martin organizes social actions with the Barcelona-based artist collective “Enmedio” (which translates to “among” in English). One such action, which showcases the group’s trademark combination of interventionist tactics and politically engaged artistic practice, is Evictions Are Not Numbers, They Are Faces and Eyes (2012). For this action, which took place on the one-year anniversary of the first M15 protests, members of Enmedio pasted portraits of evicted Spaniards onto the storefront windows of banks around the country. The large photographs put faces to the names of those that the banks would not or could not support, frankly embodying the consequences of the financial crisis. W. Kamau Bell – Walter Kamau Bell (better known as W. Kamau Bell) is an American stand-up comic. Prominent within the San Francisco stand-up comedy scene, he is best known as the former host of the FXX television series Totally Biased with W. Kamau Bell. Aziz Ansari is an American actor and comedian. He starred as Tom Haverford on the NBC show Parks and Recreation. What is our Two Drink Minimum that “helps ease people into the issues or discussions we want them to have”? What is our 3 drink maximum? What is the freedom and the boundaries we give our audiences. Creating and performing drafts in front of an audience. Punching up vs punching down – see also How Obama has weaponized wit. Anthony Jeselnik is an American comedian, television host, writer, producer, and actor. Jeselnik is known for his dark comedy style, which emphasizes misdirection, non-sequiturs, biting insults, an arrogant bearing, and a stage persona that frequently takes amoral stances. Louis C.K. is an American comedian, actor, writer, producer, director and editor. He is the creator, star, writer, director, executive producer and primary editor of the acclaimed FX comedy series Louie. C.K. has won a 2012 Peabody Award and five Emmy awards, as well as numerous awards for The Chris Rock Show and Louie, as well as his stand-up specials Live at the Beacon Theater (2011) and Oh My God (2013). Amy Schumer is an American stand-up comedian, writer and actress. She placed fourth on the fifth season of NBC’s Last Comic Standing and placed second on Comedy Central’s Reality Bites Back. In 2012, she held a recurring role on the Adult Swim series Delocated. She is the star of the sketch comedy series Inside Amy Schumer, which has been airing on Comedy Central since 2013. Check out more examples of comedy and activism on our site, here and here.